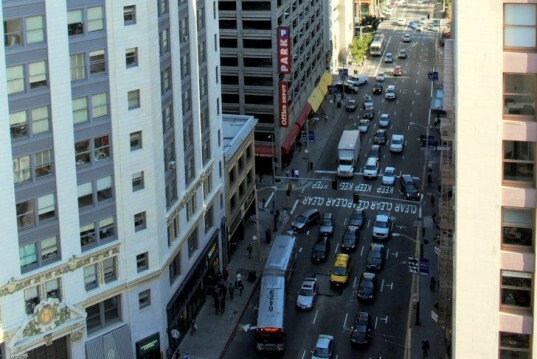 The downtown Financial District of San Francisco is a densely built urban network of high-rise office buildings, busy streets, and narrow, shaded sidewalks. However, hidden in this grid of grey concrete and asphalt are dozens of tiny parks, terraces, gardens and public art installations known as “Privately Owned Public Open Spaces” or "POPOS". Since 1985, San Francisco has required that any new large developments or office buildings also create publicly accessible open spaces. San Francisco Planning and Urban Research (SPUR) conducted a research project on these spaces and compiled a guide so city dwellers could seek out a sunny spot for lunch or a quiet nook to read in. What’s even better is there are several new spaces that have been completed even since SPUR’s guide came out in back 2009. 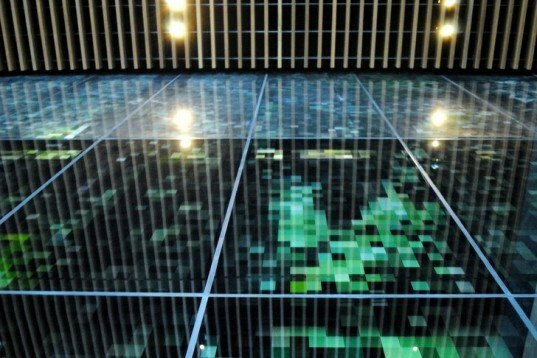 While these spaces are technically public, they are not always easy to find. Some spaces are street level courtyards, but others require signing in at a building's front desk and taking an elevator, or simply spotting a tiny sign that indicates a public space is nearby. We scouted out the newest open spaces for you so can easily find one of San Francisco's secret gardens for your next coffee break or lunch date! 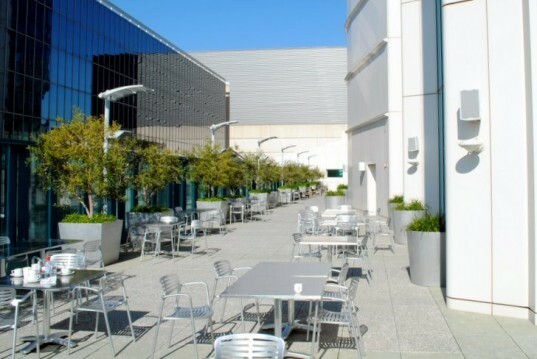 First we visited 555 Mission Street, a gorgeously designed courtyard between two buildings. You can’t miss it because it features some eye-catching and whimsical public art: Jonathan Borofsky’s stacked tower of brilliantly painted steel humanoid figures and a trio of monstrous heads by Swiss sculptor Ugo Rondinone. Visitors can sit on benches beneath a vine-draped living wall and inhale the scent of lavender plantings. To the rear of the courtyard, a series of modernist black granite benches are placed out in the sun, with a stark arrangement of trees and gravel completing the scene. We locked our bikes up outside at the hefty bike racks at 888 Howard and entered the revolving door to the Hotel Intercontinental. After navigating our way through the lobby, we found the elevators and made our way up to the public terraces located on the 4th and 6th floors. The fourth floor terrace was enclosed in a vinyl tent and we deduced that a reception would be taking place there later. We headed up to the second terrace on the 6th floor, where a sign on the door indicated that the terrace was open to the public. The Intercontinental has installed glass walls around the terrace, which we had heard was famously windy, and completed the scene with a variety of aluminum cafe tables and chairs. The terrace was a quiet and warm respite several floors above the noise of Howard Street. We headed over to one of the newest “POPOS” at 1 Kearny Street and entered the modern lobby decorated with asymmetrical Scandinavian-style birch wood wall decor. We had to sign in with a security guard who led us to the elevator, where we saw a sign indicating there was a public space within (there was no sign outside). 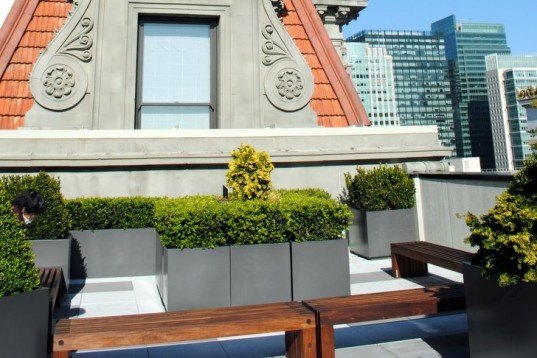 It was then up to the rooftop, where we found a tiny but sunny and very attractive roof terrace with wooden benches, plantings, and a birds-eye view of downtown San Francisco. There was even a restroom on the roof for visitors. 301 Mission Street was the next stop on the list. We guarantee you would never know this space was here – unless you were looking for the address! The dark shaded glass windows make this decorative lobby look just like any other office from the outside. Once indoors, there are modern benches, plantings, and a unique green glass mosaic against the rear wall, along with restrooms. If you were touring downtown on a rainy day or needed to find a place for a informal meeting, this could be just the place for a quick break. At 300 Spear street we discovered a unique outdoor courtyard between several building towers. This space features otherwordly hillocks of green grass, each topped with a single tree and surrounded by sleek circular aluminum benches. To the sides of the hills are granite steps in pyramid formation topped by landscaped planters. This open space was sunny and quiet, but completely empty, perhaps because it is slightly removed from lunch options and many of the offices. Finally we trekked up the stairs from Mission street to spy on the terrace at 100 First Street – the busiest open space we saw. Office workers were sunning, reading, and eating lunch despite the birds-eye view onto the massive construction site of the new Transbay Terminal just below. 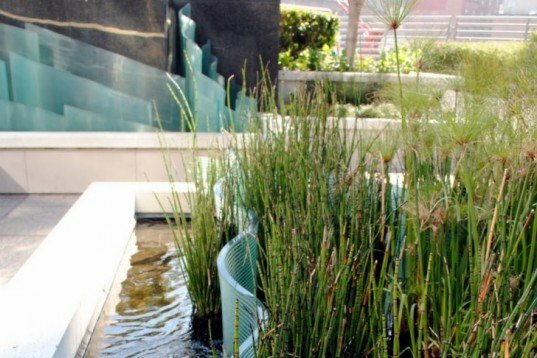 The terrace at 100 First Street catches the sun and features a variety of seating options, lots of plantings, and unique sculptures placed into water features. 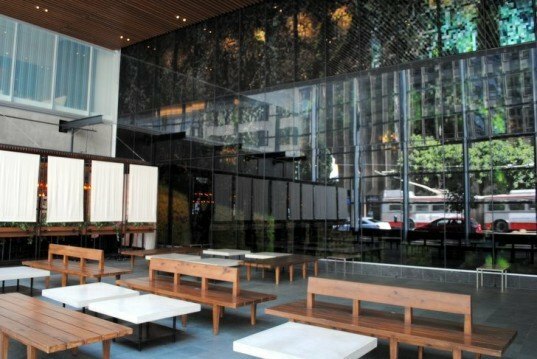 First we visited 555 Mission Street, a gorgeously designed courtyard between two buildings. 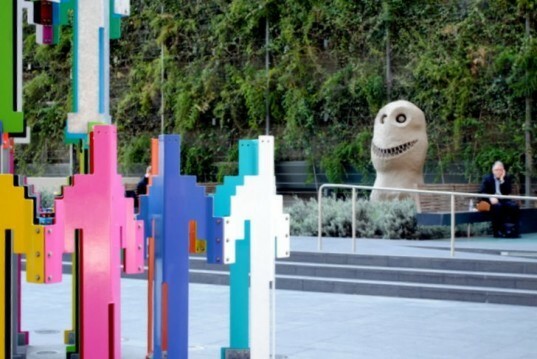 You can't miss it because it features some eye-catching and whimsical public art: Jonathan Borofsky's stacked tower of brilliantly painted steel humanoid figures and a trio of monstrous heads by Swiss sculptor Ugo Rondinone. A5 555 Mission's Courtyard, visitors can sit on benches beneath a vine-draped living wall and inhale the scent of lavender plantings. 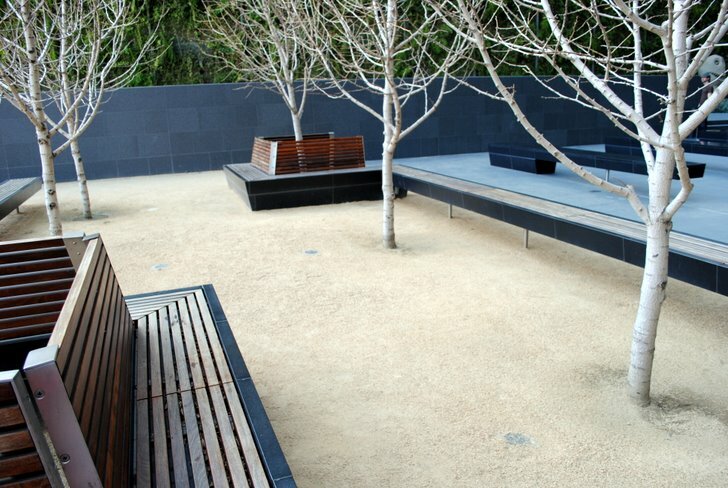 To the rear of the courtyard, a series of modernist black granite benches are placed out in the sun, with a stark arrangement of trees and gravel completing the scene. We locked our bikes up outside at the hefty bike racks at 888 Howard and entered the revolving door to the Hotel Intercontinental. After navigating our way through the lobby, we found the elevators and made our way up to the public terraces located on the 4th and 6th floors. The fourth floor terrace was enclosed in a vinyl tent and we deduced that a reception would be taking place there later. We headed up to the second terrace on the 6th floor, where a sign on the door indicated that the terrace was indeed a "POPOS". The Intercontinental has installed glass walls around the terrace, which we had heard was famously windy, and completed the scene with a variety of aluminum cafe tables and chairs. The terrace was a quiet and warm respite several floors above the noise of Howard Street. We visited one of the newest "POPOS" at 1 Kearny Street and headed into the modern lobby decorated with asymmetrical Scandinavian-style birch wood wall decor. at 1 Kearny, we had to sign in with a security guard who led us to the elevator, where we saw a sign indicating there was a public space within (there was no sign outside). We headed up to the rooftop, where we found a tiny but sunny and very attractive roof terrace with wooden benches, plantings, and a birds-eye view of downtown San Francisco. The impressive birds-eye view of San Francisco from 1 Kearny's terrace. There was even a restroom on the roof for visitors. 301 Mission Street was the next stop on the list. We guarantee you would never know this space was here - unless you were looking for the address and happened to spot the tiny metal shield with the city's public space insignia on it! The dark shaded glass windows make this decorative lobby look just like any other office from the outside. 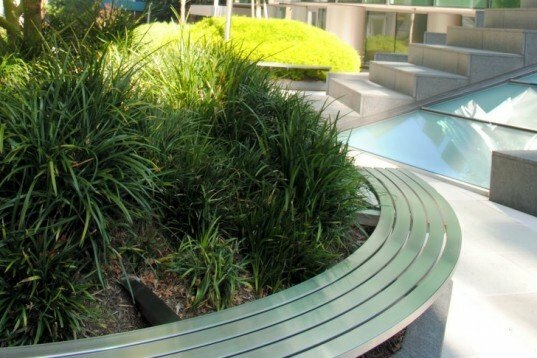 Inside the open space at 301 Mission, there are modern benches, plantings, and a unique green glass mosaic against the rear wall, along with restrooms. If you were touring downtown on a rainy day or needed to find a place for a informal meeting, this could be just the place for a quick break. 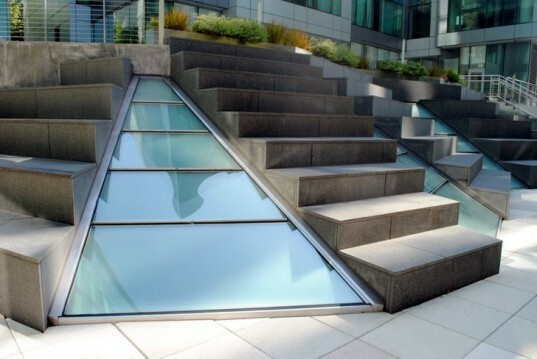 To the sides of the hillocks at 300 Spear Street are granite steps in pyramid formation topped by landscaped planters. This open space was sunny and quiet, but completely empty, perhaps because it is slightly removed from lunch options and many of the offices. Finally we trekked up the stairs from Mission street to spy on the terrace at 100 First Street - the busiest open space we saw. 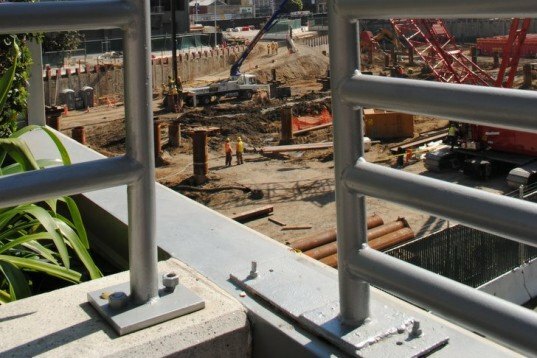 Office workers were sunning, reading, and eating lunch despite the birds-eye view onto the massive construction site of the new Transbay Terminal just below.